Canada is a preferred destination for those seeking a new nation to call home. A key reason for this attraction to Canada is its openness to and acceptance of immigrants. Canada has one of the highest immigrant-to-population ratios of the OECD countries. According to a National Household Survey, in 2011, about 21 percent of Canada’s population were immigrants, and 13 different ‘ethnic-origin’ groups had more than one million members living in Canada. The Government of Canada plans on admitting a high number of new immigrants to the country in 2016, with a target of 300,000 permanent residents into the country. Most will become new Canadian citizens within five years. This is up from a 2015 target of 279,000. The largest percentage increase in planned immigration comes in the Refugee and Humanitarian category of immigrants, with the target rising from 29,900 in 2015 to 59,400 in 2016. According to the 2011 National Household Survey, 85.6 percent of all immigrants eligible to achieve citizenship had done so. People who immigrate to Canada want to stay and put down roots at very high rates. This is in comparison with a rate of 74.0 percent of immigrants in Australia in 2011, and 43.7 percent in the US in 2010. Throughout this report, we use the terms ‘immigrant’ and ‘new Canadian’ interchangeably, as we are interested in all of the people who move to Canada and start businesses, regardless of their stage in the naturalization process. When it comes to livelihood, new Canadians have a choice of employment options. We chose to look at entrepreneurs – industrious new citizens who choose to establish and operate their own businesses. Nevertheless, why do they come to Canada? Why do they decide to open a business? What are the challenges they face and the factors that explain their success? This report explores these questions by looking at relevant literature, data, and interviews with entrepreneurs in the Vancouver area. We found that immigrants/New Canadians become entrepreneurs in Canada for a variety of different reasons. While some had businesses or experience in similar industries in their country of origin, others see a new opportunity and decide to take it. While some search for independence and want to take responsibility for their own work, others face barriers in the labour market and see opening a business or being self-employed as an adaptation strategy out of necessity. Even though the specific factors that contribute to each entrepreneur’s success are very diverse, they are more often than not related to each individual’s personal drive, educational attainment, work experience, personal and professional networks, access to credit, and the competency of the people working with them. Finally, the common thread running through each narrative is the importance of resilience: an incredibly strong personal drive to succeed is ubiquitous among the individuals we spoke with. 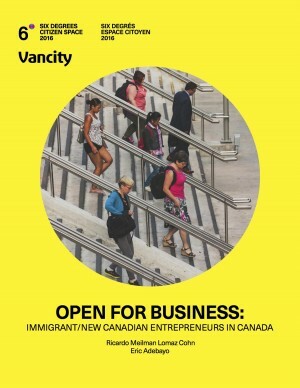 This report is the result of reviewing relevant literature and conducting interviews with a number of immigrant entrepreneurs in the Vancouver, BC region. It includes information about why so many people each year immigrate to Canada out of the many countries to choose from, trends in Canadian immigration over time, how entrepreneurs do after they get to Canada, immigrants’ feelings of social inclusion in Canada, and what some immigrants feel could be done to further integration and inclusiveness in Canadian society.